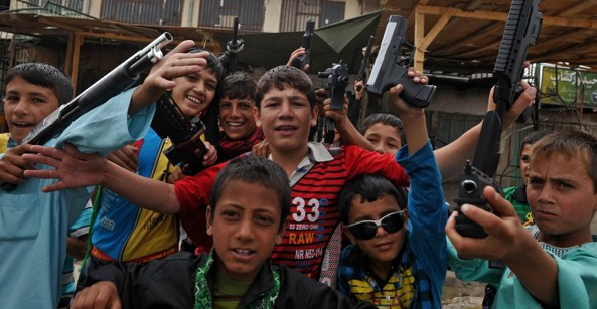 Afghan children play with plastic guns in Bagram. Massoud Hossaini / AFP/Getty Images. On Sunday The Washington Post ran a harrowing story about the “era of endless war” that the United States is settling into—in its politics, its military, its society as a whole. “Peace” … has become something of a dirty word in Washington foreign-policy circles. Earlier this year, the House voted to cut all funding for the congressionally funded U.S. Institute of Peace. If peace does not reflect the world we deal with, what would? U.S. Institute of Invasion and Occupation? That would be somewhat closer to what the USIP has actually been doing, unfortunately.